The rules and principles of Krav-Maga are more important than the techniques. A technique can help in a particular situation, but a principle can help you find your way in the infinity of variations in the real life. Many techniques you'll forget in time, but the rules and principles will guide you in all aspects of your life. Imi Lichtenfeld characterized Krav-Maga as being stability in motion and plotted this by a triangle framed by a circle. 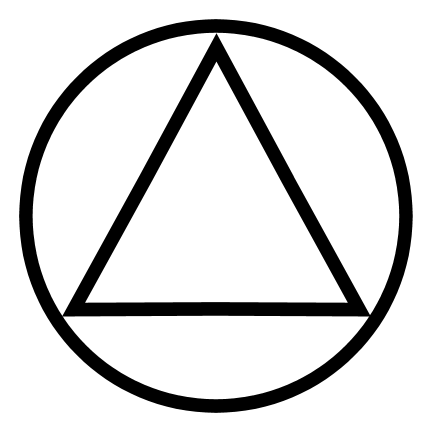 The circle symbolizes the dynamism and the continuous approach of the aggressor (to enter into the aggressor = lehikanes - in Hebrew) and the triangle symbolizes own stability (to stay = lehishaer - in Hebrew). Only the optimal combination of these two features ensures maximum chances of success. Currently, our school is the only in the world that uses this symbol and the expression stability in motion in its name: Krav-Maga Stability in Motion. Understanding the two concepts (stability and motion) and the way of combining them is the key to Krav-Maga's efficiency. Use a specific defense for a specific attack. Minimum way, maximum speed and power for strikes. No movement will be strange to your body and mind. Do what you can, but do it right. There are no shortcuts. We always recommend the avoidance of physical conflicts at all costs. The general principles described below relate to situations where the physical conflict could not be avoided and your health or your life are in danger. We must be prepared to deal with multiple aggressors, in the most adverse environments. We must have a distributive attention and to properly assess the priority of the threats around. We will remove individual aggressors as soon as possible, so that we have time to deal with the others. We will avoid to reach the ground because we expose ourselves too much and our mobility and our options become very limited. We must be prepared to deal with a stronger, faster and more technical aggressor. No matter how much we prepare physicaly, our strength, endurance and speed are limited. The most important weapon is our mind, not our body. To prevent injuries we will not block in force the attacks of the aggressors. We will not try to resist the force of the aggressor. We will not reveal our knowledge and intentions, using the surprise to our advantage. Not being bound by any rule, we will attack the most sensitive areas of the aggressor, to achieve the maximum effectiveness of each action. There is no defense without attack. Otherwise we are offering to the aggressor new opportunities to hurt us. We will always approach the aggressor, thus taking the initiative and the control of actions. Besides these general principles there are many principles specific to certain techniques of Krav-Maga. These principles are taught together with the techniques and allows you to find your way in situations where the real aggressions are not identical with those for which you have practiced the defenses. In Krav-Maga, for each threat there are several defenses, attacks or combined actions. The following are just groups of techniques, each including 1-12 different techniques. In case of repeating groups, at higher belts are taught new techniques, more complex or with higher destructive potential. We omitted intentionally some techniques existing in Krav-Maga, especially at higher belts. We teach defenses to all possible aggressions: punches, kicks, grabs of body and clothing, strangulations and hugs, attacks with weapons and firearms etc. We cover all possible situations: one or more attackers, in open or closed spaces, standing or on the ground, at short distance or against the attacker etc. Our school teaches unchanged the techniques and principles created by the founder of Krav-Maga, Imi Lichtenfeld. The instructor will teach the techniques in the order that he considers to be optimal for the development of students, regardless of the differentiation of techniques or students depending on the belts. Thus, in certain situations, a beginner can learn techniques from upper belts. The advanced students will constantly repeat the basic techniques, too. The groups of techniques are presented in the order that must be learned in order to obtain colored belts. Between brackets are the names of the groups of techniques in Hebrew.